Here is a quick overview of the requirements in the Air District's Regulation 6, Rule 3: Wood-Burning Devices. The Air District's Wood-Burning Rule sets restrictions on wood burning throughout the Bay Area. For possible exemptions from the rule, please review this Exemption Guidance Document. Effective November 1, 2016, recent wood-burning rule amendments require anyone whose sole source of heat is a wood-burning device to utilize an EPA-certified or pellet-fueled device that is registered with the Air District for an exemption from the burn ban. An open hearth fireplace will no longer qualify for an exemption. Check before burning from November through February. If air pollution levels are forecast to be unhealthy, the Air District will issue a Winter Spare the Air Alert, which bans wood burning both indoors and outdoors. 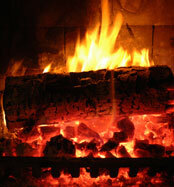 Refrain from burning wood, firelogs, or pellets when a Winter Spare the Air Alert is issued. This applies to households and businesses with fireplaces or other wood-burning devices, such as hotels and restaurants. It is okay to use gas-fueled fireplaces and logs, gas inserts, or electrical fireplaces. Never burn any garbage, plastics, wrapping paper, or other inappropriate materials. Burn cleanly when burning is allowed. Burn only clean, dry wood in short, hot fires with plenty of air, in order to prevent dirty smoke from chimneys or flues. Manufacture or sell only EPA-certified wood-burning and pellet-fueled devices for use within the Air District jurisdiction. These devices must meet the very latest EPA standards as of January 1, 2016. Gas-fueled fireplaces and logs, gas inserts, and electrical fireplaces are allowed. Provide information to purchasers on proper installation, operation, and maintenance of the wood-burning device and on the health effects of wood smoke, such as this point of purchase flier. Provide documentation to purchasers that any wood-burning device sold is EPA-certified. Label the product package with information about burning curtailment, reminding the purchaser to check the Winter Spare the Air Alert status before burning. Here is the most recent information about the labeling requirement. - “Unseasoned” (green), if the moisture content is greater than 20 percent, and provide instructions on how to properly dry the wood before burning. Information about burning curtailment, reminding the purchaser to check the Winter Spare the Air Alert status before burning, such as this point of purchase flier. Here is the most recent information about the labeling requirement.